If there is one complaint that I have about my short four-year travel life , it is the fact that none of my travels had taken me anywhere close to my home country, India. Circumstances and curiosity had always taken me away from my home on all of my vacations. It was hence a pleasant surprise when my company decided to post me in India (Pune to be precise) for a 3 week assignment. I decided to make use of the windfall by packing in a tight travel schedule in whatever time I would get off from work. I was also glad to rejoin my old travel partner, Amit (Fido for the people closer to us), who had by this time relocated to Pune and by a strange turn of events was working for the same company as me. He was single handily responsible for converting my stay from a job assignment to a holiday. The first weekend saw us leave to Aurangabad to visit the famous rock cut caves of Ajanta and Ellora. We were joined by my fiancee, Aparna, and a few of our office mates. In the first millennium AD rock cut caves were the prime real estate sought after by all the monks in the region. About 1200 caves sprung up all over Deccan to cater to the demand. Ajanta, Ellora and Elephanta caves are easily the most famous of the lot. We reached Ellora (situated 30 kms from Aurangabad) about 6 hours after we left Pune. It houses 34 caves covering a distance of 2 km in length. 12 of the caves are buddhist (600 AD to 800 AD), 17 hindu (600 AD - 900 AD) and the rest jain (800 AD - 1000 AD). These caves definitely serve as the finest example of religious tolerance practised by man, fact made obvious after observing how well the current religions coexist in a same neighbourhood. 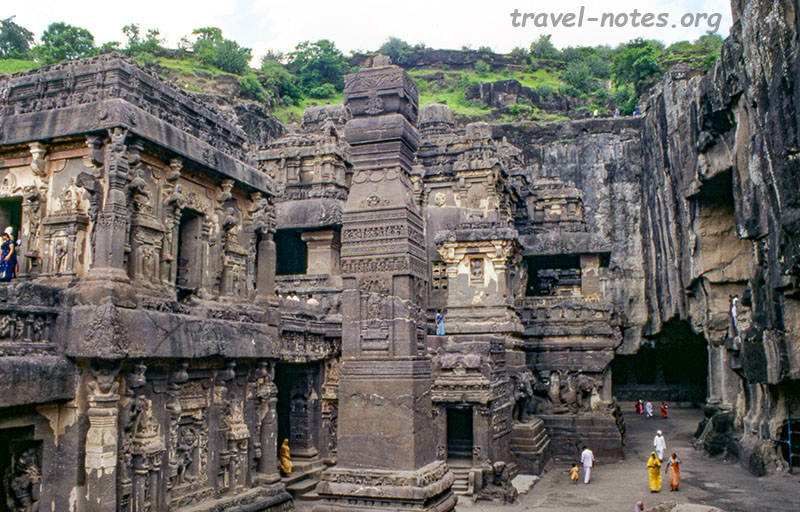 Ellora caves served as chapels (Chaityas), monasteries (Viharas) and temples for the monks. The pick of the caves is the cave no. 16, Kailashanath temple, a breathtaking piece of hindu architecture. Built over 150 years starting 760 AD under the Rashtrakutas, this is the largest monolith in the world. The temple is covered with exquisite sculptures depicting scenes from the great epics of Hinduism, Ramayana and Mahabharatha. Every other cave in the system pales in its comparison so much so that you hardly remember any of them when you leave the place. Just for the record, the best of the other also-carved are the cave no. 10, the only chaitya, and the cave no. 12, a three storied vihara. We had enough time left in the day to make a lightening visit to Daulatabad Fort. 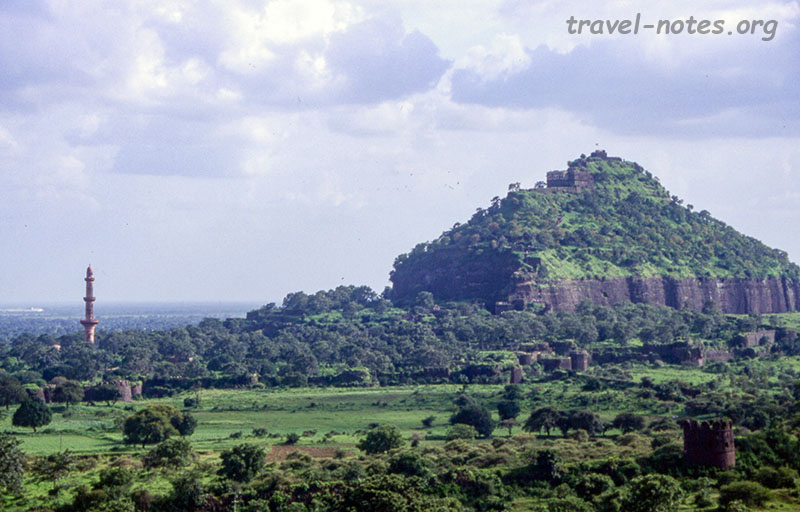 Situated 13 kms from Aurangabad, it is the strongest fort in Deccan. Known originally as Devagiri by the Yadavs it was built in 11 century AD and was captured by Alah-ud-din Kilji by treachery. This fort was made famous when Muhammud-ibn-tughlaq tried to move his capital here from Delhi. It was this insane migration that brought islam to the south and changed the demography of the Deccan. The fort houses a palace situated on top of a 200m hill and 210 ft minar (Chand minar, in height second only to the more famous Qutub), a 6.1m long cannon and a large water tank. In a bid to save some driving time, we ended up spending the night in Sillod, a village midway between Aurangabad and Ajanta. We slept in the most deplorable conditions in an excuse of a motel. I will not mention more of it for the fear of ending up reading about it on a later date. The only positive to come out of the adventure was that we were all up and ready to leave for Ajanta very early in the following morning. Ajanta caves, situated 166 kms from Aurangabad, is cut from a much steeper face of a gorge and is hence located in much more dramatic setting. 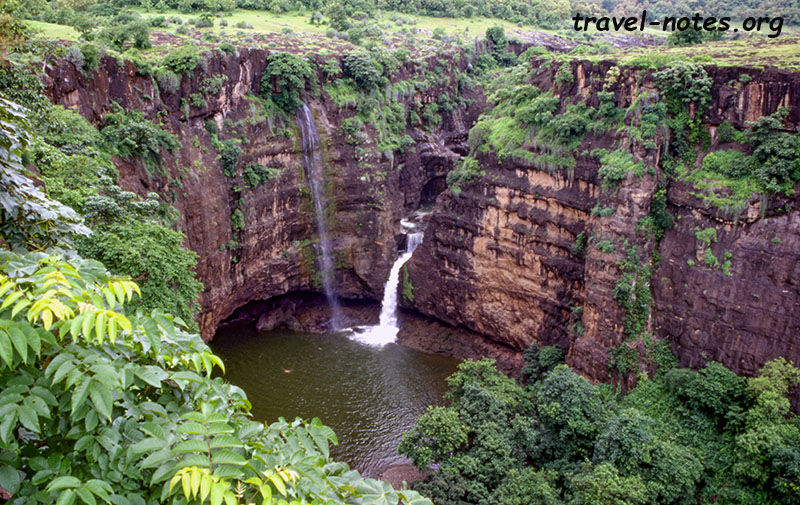 The monsoons had doubled the beauty of the place by supplying it with lush greenery and very pretty waterfalls. The jaw-dropping view from the "viewpoint" on the opposite face of the gorge was itself worth all the effort. 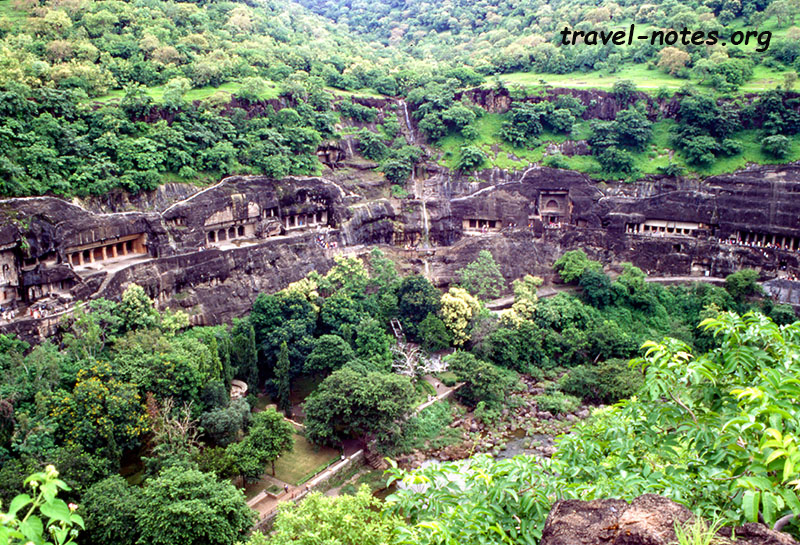 All the 29 caves in Ajanta are buddhist and were built between 200 BC and 600 AD. Ajanta is more famous for its paintings although most of them have faded quite a bit over time. Caves clearly depict the evolution of buddhist architecture from the Hinayana period where buddha was not represented in human form to the Mahayana period with the larger than life buddha statues. The highlight of the place are the image of Padmapani, relief of 4 deer sharing a common head (cave no. 1), the chaitya of cave no. 19 and the reclining Buddha in cave no. 26. The main Buddha statue in the cave no. 1 is supposed to depict three different moods depending upon where the light is shown from. Unfortunately we couldn't witness it as the guards refused to comply. We spent the rest of the day checking out the attractions of Aurangabad. The city houses the "unknown Taj" also known as the Bibi ka Maqqbara, a tomb built by Aurangazeb to his wife Rabia Durani. 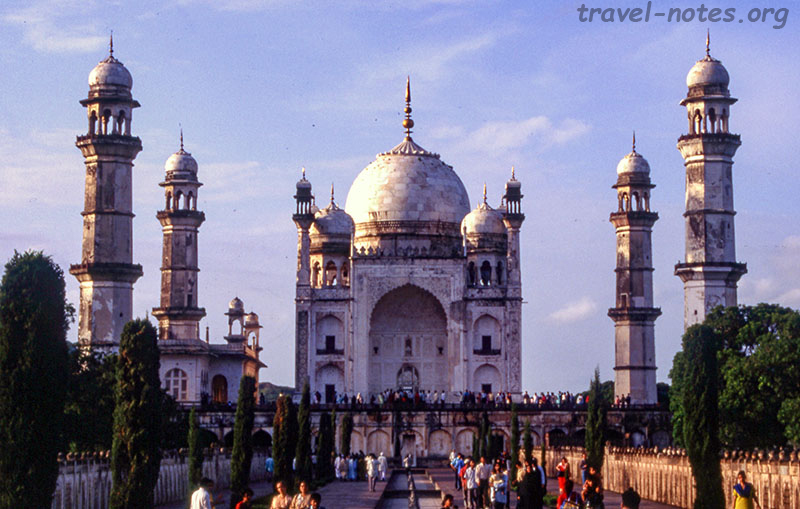 It was built 25 yrs after Taj and was modelled after it. Although a wonderful monument in its own regard, due to its shape, it gets unfairly compared with the Taj and leaves an impression of being a poor imitation of the great monument. By the way, the nearby water mill (Panchakki) isn't worth half the effort spent in driving upto the place. Click here for more photos from Ajanta and Ellora Caves. Click here for more photos from Aurangabad.